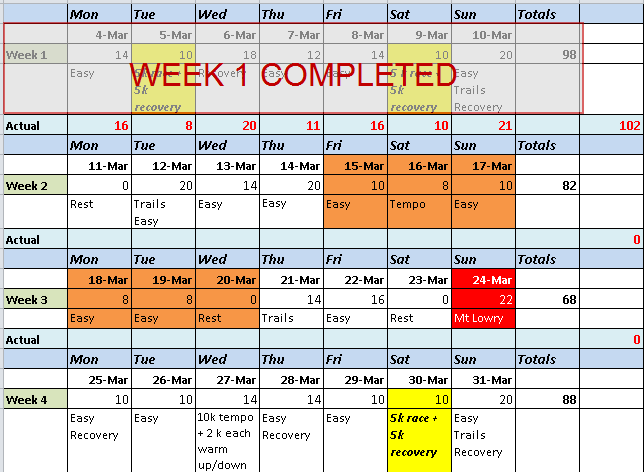 So I am now 1 week into my 16 week Marathon training plan! This was a good week and I was able to complete a 7 days of running from Monday to Sunday with a net total of 102kms which incidentally also is the most number of kms in a week that I have run. The last week was a pretty good week in terms of getting to the total 100km net goal without hurting myself too much. Also I’ve got used to having shorter recovery times in between runs. The highlights were being able to do 2 x 16km steady runs and 2 x 20km runs as well as 2 x 5ks @ my race pace. Fortnightly deep tissue massage from Gary Moller – Gary has a wealth of knowledge when it comes to running and sports recovery and has been taking care of my aching legs for over an year now. The intense sessions are not easy but they do a lot in terms of my recovery. 3 times a week (Usually Mon, Wed, Fri) strength and core exercise sessions (Bootcamp style) with the team at Power of S.
Group runs with my running buddies from Wellington Running Meetup – great for easy pace recovery runs! Today (Monday) was my rest day. This week I’m going to do some hill running (Multiple times up Mt Victoria or Tinakori Hill) in preparation for Mt Lowry challenge 22k run on the 24th of March. This entry was posted in Marathon, Running, Training and tagged group runs, Marathon, Training by 74Runner. Bookmark the permalink.